CELTA Course Grammar: How to remember all the rules? How am I going to learn and remember all the grammar rules for my [CELTA course]? I’m a native English speaker but it’s a mystery how I know how to speak [English] so well! Firstly, you don’t need to know all the grammar when you start – CELTA is an entry-level course so your tutors will only expect you to have a basic knowledge of grammar. In fact, many of the non-native speaker students often have a far superior knowledge of grammar compared to their native speaker counterparts. The main point is that you need to have an awareness of grammar and are able to learn and apply what you learn quickly. If you have learnt a foreign language at school (or anywhere else), that can help you here by reflecting on the different rules and concepts you learnt about during your language courses. CELTA Course Grammar Rules: How to remember them? Secondly, the CELTA is very much about ‘just-in-time learning’; you only have to learn the grammar point for your next teaching practice in detail. Remember this point – it will save you a lot of stress and help you to focus on the job at hand! Yes, you need some knowledge of the basic rules but you only need to have the detailed knowledge of what you are teaching that day. A useful tip here is not to let students take you off topic during your teaching practice on the CELTA course – if they ask a grammar question like “How is the past continuous different to the past simple?” when you are only teaching one of those verb tenses, you can simply tell them you will that point another day. Remember that you can control and manage their learning, and part of that means staying focused on the learning objective you are teaching. The main CELTA grammar points I would suggest focusing on before the course would be verb tenses (form and use), and the different ‘parts of speech’ (nouns, verbs, etc.) – knowing these should help your confidence going into the course. If you follow the above, you should be fine! Jo Gakonga has some fantastic videos on teaching grammar on her Youtube channel, along with online grammar course. Check the video below for an example! How to improve my knowledge of verb tenses before starting my CELTA course? OK, so now it’s your turn! 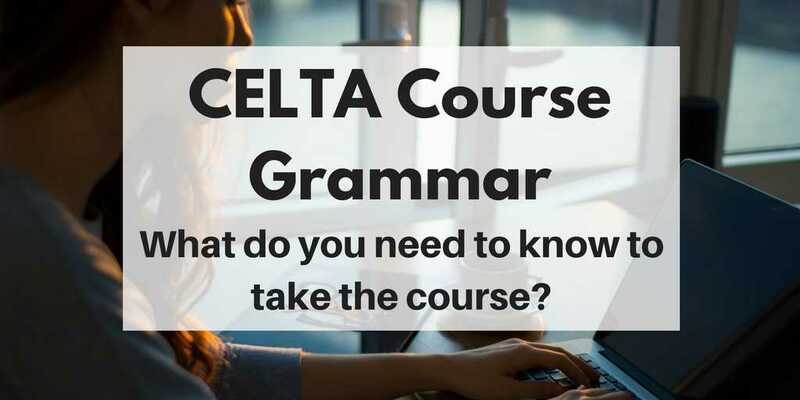 Do you have any CELTA course grammar questions to ask me? If so, leave them in the comments below or over on my CELTA Helper Facebook page! For any immediate answers, you can try my CELTA Helper Facebook Messenger service!